MOEMS includes two major technologies, MEMS and Micro-optics. Both these two technologies independently involve in batch processing similar to integrated circuits, and micromachining similar to fabrication of microsensor. During the 1980s the acronym of MEMS created a fortune for publication, getting government contracts and publicity. DARPA assigned a program manager for this field and significantly soon MEMS is promoted to be the king of the technology. Several high tech journals that were originated were attached to MEMS by supporting miniaturization and low cost manufacturing. Many private companies which did not have sufficient knowledge about MEMS also started jumping on the bandwagon. Parallel with MEMS developments and even earlier, sensor technology advanced to microsensors and joining with microactuators. Development of microsensors and microactuators were also due to a mother technology of micromachining. Micromachining is the root of everything we have today in high technology. This technology was never credited in history as it deserved. It was commercially used during the 1960s in Switzerland, for micromachining quartz orders of magnitudes harder than micromachining silicon. MEMS acronym was so powerful during the 1980s, that with no choice microsensors and microactuators that included micromachining, all joined MEMS by a soft landing. As a result, the MEMS acronym was more attractive for publicity and even today MEMS, is dominating in microtechnologies without giving credit to its real parents. During the MEMS era, and before that time frame, Rockwell International was involved in commercial MEMS development under government contracts. During early 1980s Rockwell successfully built the first CMOS MEMS high performance and high G accelerometer chip for space applications. The wafer was processed inside Rockwell VLSI lab in Anaheim, CA. This was a breakthrough in MEMS technology, but it did not appear in literature until 1988. During the early 1990s, Rockwell Science Center, through internal research and commercial programs with government sponsors, contributed to the development of micro-optics technology Teamed with MIT/Lincoln-Lab. During 1992, Rockwell applied micro-optics to the system development of several industrial applications, including, microlenses for silicon focal planes, high speed binary microlens in GaAs, antireflection surfaces in silicon, thin film microlens arrays, beam steering device, microlens integration with focal plane arrays, and optical transformer and collimator. Rockwell Science Center also developed refractive microlens technology, including gray scale photolithography. Diffractive microlenses based on binary optic structures are typically fabricated in bulk material by multiple sequential layers of photoresist patterning and reactive ion etching (RIE), to form a multi-step phase profile. This profile approximates the ideal kinoform lens surface. A special staircase process, called binary optics, is used to fabricate diffractive components. With so many successes in Micro-optics and MEMS, Rockwell researchers who were involved in both MEMS and Micro-optics, initiate development of several of innovative photonics ideas combining both technologies. 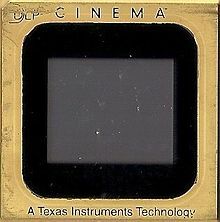 This was behind the acronym of MOEMS, when both MEMS and Micro-optics were merged in one single IC processing lab. MOEMS is a promising multi technology for miniaturization of critical optical systems. The acronym is defined of three high tech fields of micro-optics, micromechanics, and microelectronics. MOEMS indirectly could merge in micromachining, microsensors and microactuators if their processes are compatible with integrated circuits. Merging all these multi technologies, made MOEMS an ideal knowhow for many industrial demonstrations of commercial devices, such as optical switches, digital micromirror devices or DMD (see DLP), bistable mirrors, laser scanners, optical shutters, and dynamic micromirror displays. All technologies of MOEMS have the potential of batch processing and embossed replication which, again, makes them highly attractive and necessary for commercial applications. MOEMS is an enabling technology for applications that cannot be addressed, using micro-optics alone and is currently playing a significant role in numerous optical applications. The trend toward miniaturization and integration of conventional optical systems will accelerate the adoption of MOEMS technology in commercialization of many industrial components which are today’s most desirable elements of optical communication. In 1993, Dr. Motamedi officially introduced MOEMS for the first time, as the powerful combination of MEMS and Micro-optics, in an invited talk at the SPIE Critical Reviews of Optical Science and Technology conference in San Diego. In this talk Dr. Motamedi introduced the figure below, for showing that MOEMS is the interaction of three major microtechnologies; namely Micro-optics, Micromechanics, and Microelectronics. ^ M.E. Motamedi, et al, “High Speed Binary Microlens in GaAs”, Proceedings, SPIE, 1544, pp. 33–44, July 1991. ^ M.E. Motamedi, et al, “Antireflection surfaces in Silicon Using binary Optic Technology,” Applied Optics, 1 August 1992, Vo., 31, No 22, pp 4371-4376. ^ M. E. Motamedi, et al, “Laser Beam Steering Device” Conference on Binary Optics, Huntsville, AL, NASA publication No. 3227, PP 345-358, 1993. ^ M.E. Motamedi, et al, “Micro-optics integration with focal plane arrays, ” Optical Eng. vol. 36, No. 5, p.p. 1374-1382, May 1997. P. Rai-Choudhury (editor), MEMS and MOEMS. Technology and applications, SPIE Press, Washington, 2000. This page was last edited on 3 December 2017, at 04:56 (UTC).